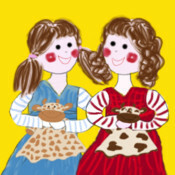 The first idea to write stories about my twin girls came in the spring time 2012. First I started to draw the characters, which took quite some time. But once I had the faces set then it got easier. I have written 5 stories about the girls and published those in one book (in iBook format on iTunes). Meanwhile I was thinking to make one interactive story (an iPad app) since this way kids can get more connected to stories, the characters if they can interact with them. I started developing the application in August and since it was my first project it was quite a long learning period. It took me about 4 months, since this was my first iPad application,s o I head to learn all the programming side as well. I like the peek-a-boos on scene3 and scene4. There are 3 different figures popping out of the box in each scene. Also my girls has laughed the most about that. Originally I didn’t have anything for the big box, but my good friend told me: while this box is not doing anything, since it’s in the middle of the picture, so I thought it would be unexpected and funny to have this peek-a-boo figures. My favourite page is the last one, where the girls are happy to put each of their animals to the toyswing. I really loved drawing all those animals and figuring out what noise they should give when touching those. First of all the social skills, kids can learn from Niki’s stubborn behaviour 🙂 Also motor skills can be enhanced by trying to put the animals to the froggy bag or putting them to the swing. The memory game in the end of the game is helping in short term memory development. I would suggest this app to kids between 2-5 years. Since it just got published, no updates are planned yet. But I have plans to make such an interactive app from the other stories in Come, play with us! And also working on a Niki and Jazmin sticker album. There are two sections to this app. The actual story and then a matching game. Toyswing is a cute and simple story about two sisters, Niki and Jazmin, who love to swing while holding their favorite toys, but have a big problem. They have trouble holding onto the swing and their toy at the same time, so they keep dropping their toys! Their mother helps them solve this pint-sized catastrophe in the story book app. Of course, being sisters, they cannot agree on much, even the color of the fabric that their mother is going to use to make their stuffed toys a swing to use. They eventually come to an agreement on this issue, as well as another. The concept of compromise is highlighted, which is very important for social development in children. At the end of the story portion of the app, an actual picture pops up of a girl with a stuffed animal in a toy swing, which I found rather touching. As far as options they are as follows: you can turn the music on or off, turn the “read the story” feature on or off, and that is about it. The story is interactive to the extent that you can touch a toy and it will move and/or make a noise, or you can touch a swing and it will move, for example. The graphics are simply drawn, but charming. There are no language options. The story also has a simple memory game of twelve cards. On the other side, there are pictures of different toys. It is a nice addition to a charming little story, especially for young kids, who this app is best suited for. I would recommend this app for kids ages of 3 to 5.